Everyone at my Thanksgiving table this year is going to have their own wishbone to break. No, I’m not cooking up 8 turkeys just so everyone gets a wishbone. I love my family, but not quite that much. I’m looking forward to the spice-brined and grilled Cornish game hens I’ll be cooking, but their little wishbones leave a lot to be desired. And if I’d been thinking back in February when I was developing the turkey recipes in this month’s Cooking Light magazine, I would have saved all those wishbones and we’d have enough! But I didn’t have that much foresight. 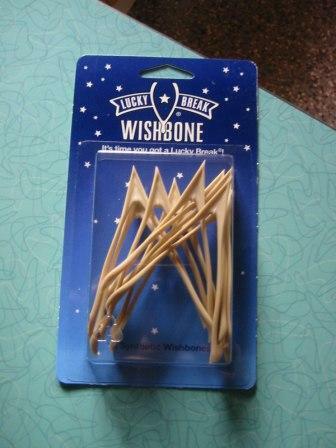 Instead, each place setting will have one of these Lucky Break Wishbones, which I picked up at my local grocery store. This is one of those simple, brilliant ideas that I’m surprised took this long to see on the market. The founder, Seattleite Ken Ahroni, has (like me) a birthday that every six years or so falls on Thanksgiving. On one of those birthday-Thanksgiving Days about a decade ago, he realized how seldom he’d actually gotten his hands on the year’s single wishbone. His wish was for every dinner guest–young and old, meat-eaters and vegetarians–to have the opportunity to make their own wish every year at Thanksgiving. And so this realistic-looking but fully synthetic (and recyclable!) wishbone was born. No more sibling rivalry. No worry about nontraditional meals of grilled salmon or lamb shanks. And if your first break isn’t so lucky, grab another wishbone and try again! Thought the package makes clear, with a disclaimer, that they make no guarantee that wishes will come true. That part’s up to you. Can you believe it? Just two weeks from today is Thanksgiving. That’s what I get for blinking. I just started to make up my mental menu plan for dinner here that day. And though I am a traditionalist so often when it comes to my favorite things to eat and drink, I’m planning to stray from the centerpiece roasted turkey this year. Not because I don’t love turkey (well, “love” would be a stretch in anyone’s book, probably, but tradition is tradition!). It’s more because earlier this year I cooked up 6 or 8 whole turkeys in the course of a week or two, as Nancy Leson mentioned in her column this week. I had been asked by Cooking Light to come up with the whole turkey recipes for this month’s holiday issue (plus some other options as well, including braised lamb shanks and polenta with sauteed mushrooms). It was an honor, and a challenge! But I had fun. I think my favorite twist on the classic was rubbing the bird with smoked paprika to contribute a lovely mahogany color and that touch of smokiness that hints of a grilled turkey. So, no turkey at my house this year, it’s going to be Cornish game hens. We’re a small troupe, so a big bird is always overkill anyway. Smaller birds are easier to manage, store, brine and grill. Yep, I’m counting on grilling; the garage is a perfect backup plan if it’s pouring. From there, it’s all classics: mashed potatoes, green beans (probably tossed with toasted hazelnuts), stuffing and my mom’s cranberry-orange relish (honestly, the recipe on the bag, the two ground together with some sugar, simple as that!). For dessert? It’s my birthday. I’ll be eating cake! But I’m sure I’ll throw together a pumpkin pie, too, for good measure.